A new restaurant and bar, serving classic American comfort food and more, has made its debut in Wrigleyville. Located at 3600 N. Clark St., the newcomer is called Dutch & Doc's. The 200-seat double-decker venue overlooks Wrigley Field's marquee and is the latest creation of BOKA Restaurant Group (Boka, Girl & The Goat, Duck Duck Goat) and chef Chris Pandel, who's also executive chef at the group's Swift & Sons steakhouse nearby. The new offering takes its name from the two most popular nicknames in Major League Baseball's history, Dutch and Doc, the Chicago Tribune reports. 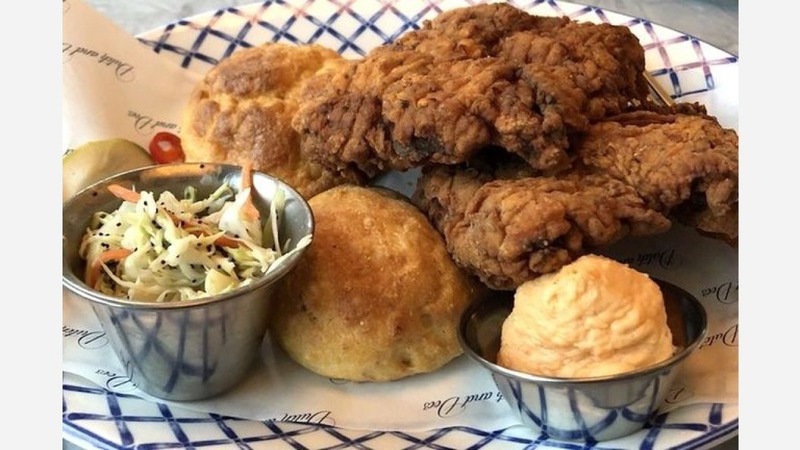 The kitchen at Dutch & Doc'sserves up lunch and dinner daily, with menu options ranging from deviled eggs to patty melts, burgers and mac and cheese. Diners can go big with the 12-ounce New York strip steak ($34) or the 22-ounce bone-in ribeye ($58). And to help wash all of that down, the bar offers wine by the bottle or glass, craft and domestic beers, and signature cocktails, including a frozen mudslide and two boozy concoctions on tap. Dutch & Doc's has received positive feedback thus far, with a four-star rating out of eight reviews on Yelp. Fernanda N., who was among the first Yelpers to review the new spot on May 27, said, "Great food, spotless service, beautiful lively atmosphere. This is a great addition to the neighborhood. We had the Con Queso as an appetizer, glazed short rib and filet mignon for dinner, and the peach dessert. Everything was delicious and perfectly cooked." And Daniel D. said, "Our apps, salads and sandwiches were great, and portions enough that we had no room for dessert. Top notch food, ambience and service; we will be back!" Interested? Stop by to welcome the new business to the neighborhood. Dutch & Doc's is open from 11 a.m.-11 p.m. on weekdays and 9 a.m.-11 p.m. on weekends.